Prion proteins are fatal neurodegenerative transmissible agents which cause incurable illnesses known as transmissible spongiform encephalopathies (TSEs). These diseases arise when the cellular form of the human prion protein (HuPrPC) undergoes several structural conversions and misfolds into its oligomeric form know as the “scrapie” prion or HuPrPSc. The misfolded human prion is most notbably the cause of Creutzfeldt–Jakob disease (CJD) in humans. This disease is associated with personality changes, anxiety, depression, and memory loss, and is usually fatal. In its cellular form the HuPrP acts as a synapse buffer and mediates copper ion concentration between neurons. Although this interaction is important, it is not completely understood. The HuPrPSc is insoluble in most organic solvents, partially resistant to Proteinase K, and prone to aggregation. This causes problems when trying to isolate the prion for x-ray crystallography. However, when in complex with nanobody 484, a nanobody with high affinity for the human prion, an ultra-clear crystal is able to form. Further understanding of the structure of the prion will lead to both understanding of the prions normal cellular function as well as the mechanism to which the cellular form folds to the scrapie. Once this mechanism is understood, a functional treatment for the fatal diseases associated with this protein can be formulated and the role of its cellular type can be solved. HuPrPC has two . These are known as the Globular domain and the N-terminal tail . The Globular domain consists of and three short anti-parallel The addition of Nb 484 to HuPrP causes enrichment of the three β-strands, but more notably the expression of the This "hairpin turn" includes a palindromic GGLGG , and is is directly exposed to solvent. Specifically, are exposed and create a dry hydrophobic pocket that allow for intermolecular β-strand stacking in either parallel or antiparallel configuration. Thus, the expression of the β0-β1 hairpin caused by the binding of Nb 484 appears to instigate the interaction with intermolecular β-strands to form steric zippers and contributes to the inhibition of HuPrP misfolding. Two papers by Hornshaw et al. suggested that PrPC binds Cu2+ in its so called octarepeat domain. This domain is composed of multiple repeats of the eight-residue sequence PHGGGWGQ. The HuPrP sequence carries four copies of this segment. This region is unstable when treated with Proteinase K, and therefore is not shown in the core model. In fact, the (displayed in this pdb as a short sequence) is actually a long chain with multiple binding domains as shown by the image below. The octarepeat domain in HuPrP spans position 70 to position 94. As found by Wopfner et. al., across different species the octarepeat domain is highly conserved within the PrP sequence. This suggests that it plays a role in a prions cellular function. As shown in Figure 2, one octarepeat domain is able to coordinate a single Cu2+ ion. This equatorial coordination is mainly done by the histidine imadazole, deprotonated amides from the glycines, and the amide carbonyl of the second glycine. There are also 3 water mediated interactions. Millhauser reports that this sequence is extremely selective towards Copper over other divalent ions due to Copper’s unique ability for acid-base interactions with the amide carbonyl of glycine. These findings further suggest that the human prion protein has something to do with Copper concentration mediation in vivo. Interestingly, when the scrapie version of this protein is cut with Proteinase K, therefore losing this octarepeat domain, it does not lose its infectivity. From this we can conclude that the ability of HuPrP to coordinate Copper does not play a role in the development of TSEs. is a nanobody generated by Abskharon et al. with a high affinity to bind to both human and mouse prion proteins. Notably, this nanobody is highly effective in inhibiting HuPrP propagation into its misfolded form. When treated with Nb 484, MoPrP amyloid seeding assays show that lag phase of fibrillization was extended by 40 hours. This indicates that the interaction of Nb 484 with the full-length MoPrP inhibits the formation of PrPSc-like aggregates. While it’s not known exactly why it inhibits the conversion, it’s likely due to steric hindrance and rigidity from bonding at the The nanobody forms 3 to the α2-β2 loop of the prion which gives the loop significant rigidity. There are also 5 significant between Nb484 and HuPrP that add to this structure. 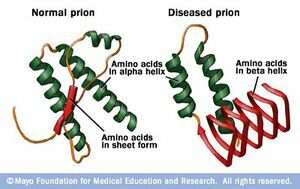 Interestingly, organisms that exhibit more rigid prion α2-β2 loops show a lower chance of prion-misfolding related disease. Futher structural stabilization of this motif may represent an effective way for Nb 484 to fully inhibit prion misfolding. Franziska Wopfner, Weidenhofer, G., Schneider, R., von Brunn, A., Gilch, S., Schwarz, T. F., Werner, T., and Schatzl, H. M. 1999. Analysis of 27 Mammalian and 9 Avian Prps Reveals High Conservation of Flexible Regions of the Prion Protein. J. Mol. Biol. 289:1163-1178. Glenn L. Millhauser. 2004. Copper Binding in the Prion Protein. Accounts of Chemical Research. 37:79–85. Martin P. Hornshaw, McDermott, J. R., Candy, J. M., and Lakey, J. H.. 1995. Copper binding to the N-terminal tandem repeat region of mammalian and avian prion protein: structural studies using synthetic peptides. Biochem. 214:993-999.